High pressure will keep the Finger Lakes quiet on Monday and Tuesday before a stormy second half of the week. With high pressure in control of the weather across the Finger Lakes, the weather will start the week on a tranquil note. Clear skies and calm winds has the Finger Lakes starting the week on the chilly side, with Monday morning temperatures mostly in the low 30s. High temperatures this afternoon will rise to the upper 40s to near 50 degrees, which is a bit below normal, despite ample sunshine. Don’t forget to check back tonight at 7pm for my 2015-2016 Winter Forecast! Clouds will start to increase overnight as a strong storm system slowly moves north, up the Mississippi River Valley. This system, currently coming onshore from the Gulf of Mexico into Louisiana, was spawned by the remains of Hurricane Patricia. 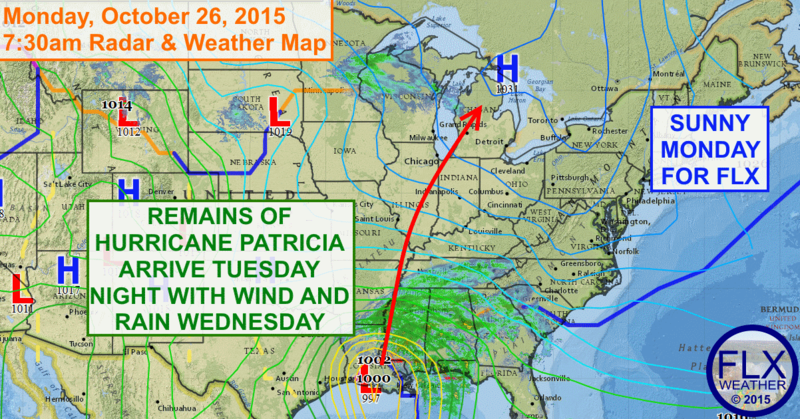 Tuesday will simply be cloudy, with no precipitation expected and just a slight wind from the south. Temperatures will respond by reaching the low 50s during the afternoon. Rain will start to move into the Finger Lakes after midnight Tuesday night. Once it arrives, the rain will persist through Wednesday, with just a few occasional breaks in the precipitation. It will also become quite windy, especially northeast of the Great Lakes and over the higher elevations. In these locations, winds could gust over 50 mph, though some uncertainty in the maximum wind speeds remains. Showers will linger into Thursday and perhaps Friday, with winds also remaining gusty on Thursday. Temperatures will be milder as this system moves through, with highs nearing 60 degrees Wednesday and Thursday.